They're off to see the Wizard. Join the gang as they traverse the Yellow Brick Road! Numbered limited edition boasts 11 actual strips of film from the movie! They're off to see the Wizard! 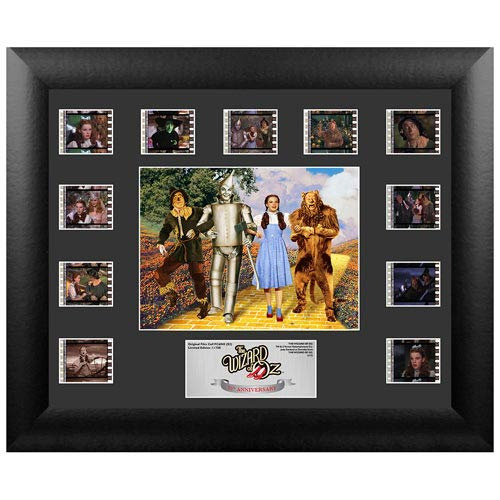 Measuring 13-inches wide x 11-inches tall in a black frame, this wonderful Wizard of Oz 75th Anniversary Series 2 Montage Film Cell celebrates the 75th anniversary of The Wizard of Oz in an official limited edition collectible that contains a classic image of the gang as they traverse the Yellow Brick Road, 11 different movie-still clips of actual film, and a numbered limited edition nameplate. With an embossed/foiled certificate of authenticity, it's a limited edition of only 1,750 pieces. Made in the USA. Ages 15 and up.